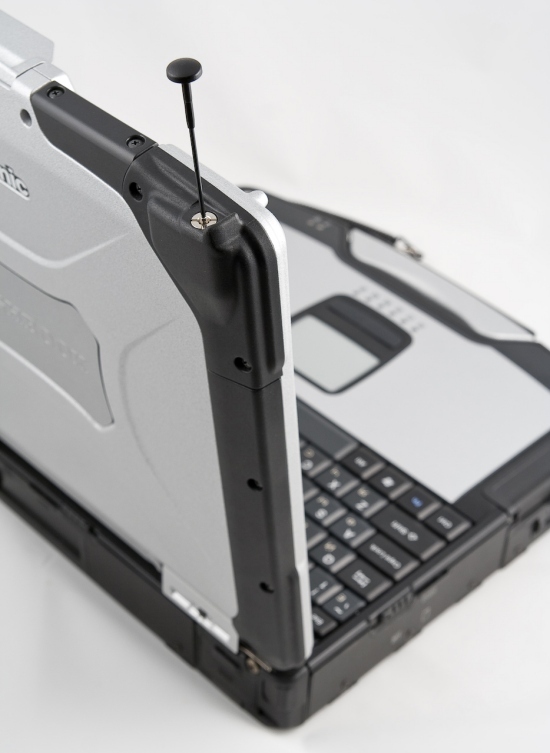 Rugged notebooks are a special class of mobile devices. They have to meet special requirements even compared to regular corporate notebooks. You cannot address these notebooks with general choice criteria. The main requirement to a rugged notebook is to operate in hostile environment and to survive various accidents, which may happen in field work. Rain, impacts, falls, operation in high and low temperatures—that's an approximate list of what may happen to a notebook. It has to survive these things and to offer a sufficient safety margin for these events not to affect its operation. In fact, all other aspects may be met half-way. Such notebooks don't have to offer high performance and ergonomics. 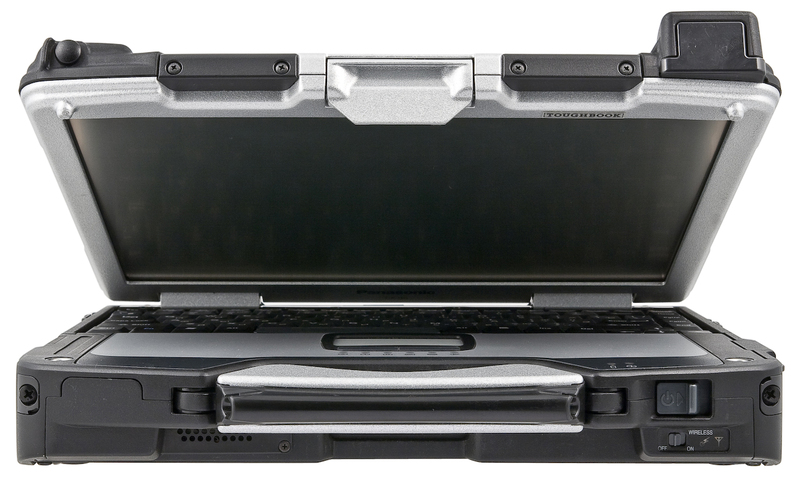 A rugged notebook does not have to execute complex and resource-intensive tasks fast, it does not need multimedia features. As a rule, ergonomic requirements to such notebooks are not very high either—but keyboard and mouse operations (or its counterparts) are still regarded as one of priorities. When you buy such a notebook, you pay much money for additional protection in the first place. The higher its protection level, the more expensive such a notebook. There exists a special classification of such notebooks by their protection level from various types of exposure (for example, protection from moisture and protection from dust). Another segment is forming now—reinforced notebooks. It's a compromise solution—a notebook possesses additional protection (for example, a reinforced case or a waterproof keyboard) and can withstand some unpleasant accidents, but it's not much more expensive than regular corporate notebooks. But it's a compromise anyway—dropping this notebook or spilling water on its keyboard is still an abnormal situation, even though it can survive it. What concerns rugged notebooks, they are designed for such situations. They must be able to work under rain, ready to fall to an asphalt floor and remain intact. That's the key difference between them and the reason for different prices. 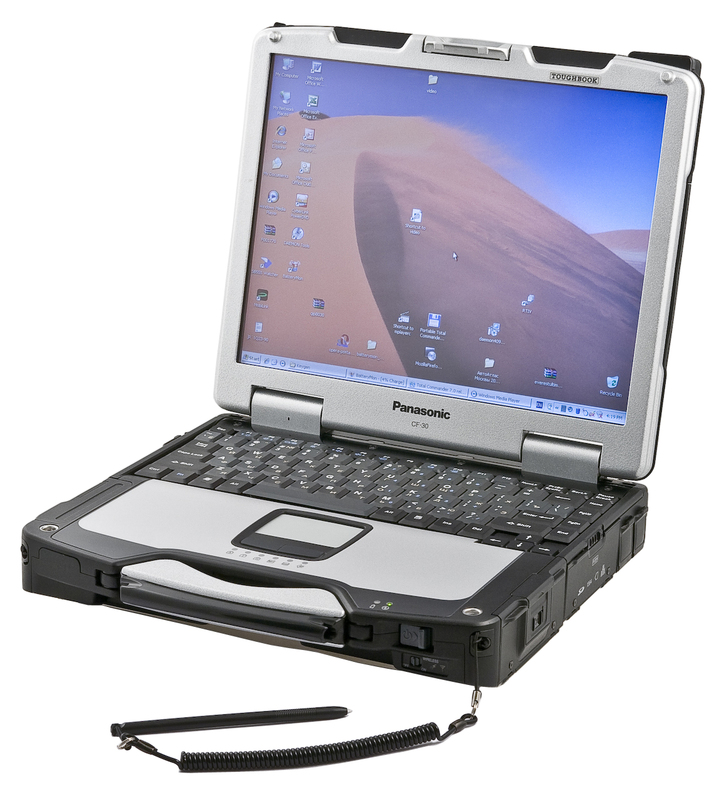 Today we are going to review a rugged notebook designed for maximum efficiency in hostile environments—Panasonic Toughbook CF-30. Panasonic occupies an interesting segment in the notebook market. Although it has inexpensive products, the company invests much money into R&D and can boast of many original product lines. 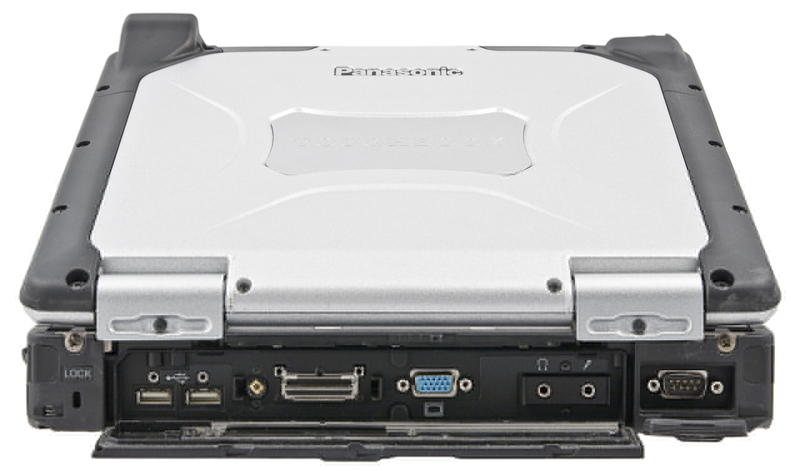 Light-weight CF-series notebooks in the first place—very small, but still equipped with a built-in optical drive. There is also a family of rugged notebooks. Panasonic supports the idea that an industrial notebook must not include compromise solutions—everything necessary must be implemented on a good level (unnecessary functions can be skipped). Costs should not be of primary importance here, because they are determined by necessary unique functions. Let's have a look at the specifications. 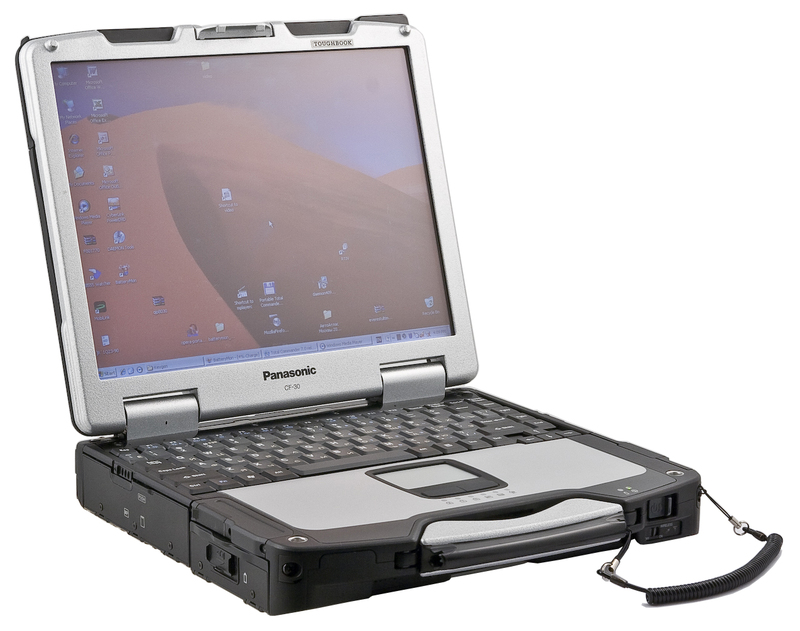 The new models of Panasonic rugged notebooks can survive almost a meter free fall or water spill, they can work in hot and cold environments, protected from dust and vibrations. A bright touchscreen and new energy efficient processors provide high performance and convenience when operating in the field. 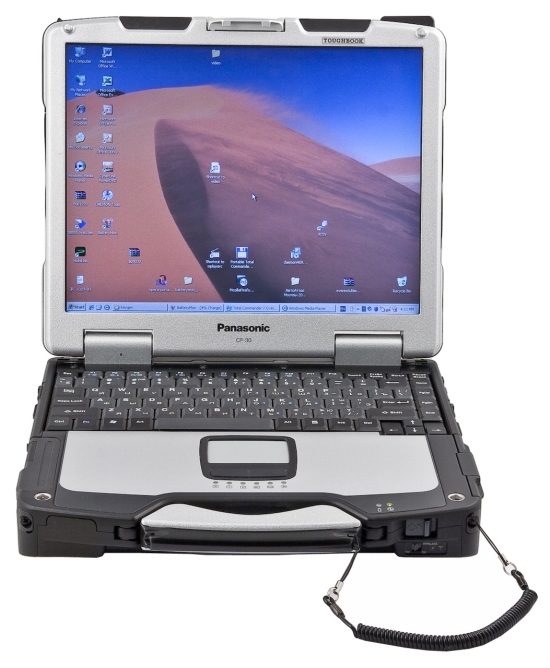 We tested the notebook in reading mode (browsing a book in a text reader) in Windows XP SP2. The system powered off, when the battery discharged to 3%. All wireless interfaces were disabled during the test. Test results for reading 8 h. 38 min. Excellent results, even taking into account high capacity of the battery. The CF-30 can work for over eight hours from a charged battery! When you deal with rugged notebooks, you unconsciously expect that ergonomics of their keyboards were sacrificed to impact and spill protection. However, to my great surprise, the CF-30 is equipped with an excellent keyboard! The keyboard has a practically optimal layout for notebooks in general, no allowances. All keys are exactly where they should be, the ctrl key is in the left corner (very convenient for various key combos), large shift keys, the group of cursor keys is separated, the del key is next to the cursor keys—very convenient! Theoretically, we can assume that the del key can be accidentally pressed together with the Left key, if you work in gloves. But it has never happened to me. On the contrary, it was very convenient to use these keys. The keyboard feels slightly inferior to the best models in feedback, but it's softer and more convenient than most usual keyboards for notebooks made in China. All keys have a rubber-like feedback, but key presses are distinct, so you have no problems with typing. On the whole, it's very convenient to type on the CF-30. So, the keyboard is a very nice surprise. You can work with the touchpad even in gloves. However, it was very slow in our sample—it required five or six passes to move the cursor from one corner of the screen into another. It can be regarded as a drawback in some cases. However, this slowness can be caused by wrong operation of the standard drivers. The good news is this notebook practically does not need the touchpad, because the CF-30 is equipped with a much more functional tool—touchscreen. This model has the most convenient option—the touchscreen reacts to any presses, not only to its stylus, but also fingers, soft pointers, etc. You can control the notebook with anything. By the way, the manual warns users not to poke the screen with sharp metal objects like a screwdriver or ball-point pen, because they may scratch the outer protective screen. It's a pleasure to work with the touchscreen—you just press where you need with your finger. It's especially convenient to work with dialog windows (you just press a button) and forms (to move the cursor to a new field, you just touch it with your finger.) However, the touchscreen will also come in handy in many other cases. There is no need to mention how convenient it is in a notebook, which will work on your laps most of the time. The touchscreen works very well, but it's slightly misaligned in the corners. The notebook comes with a special stylus, which is hidden in a carrying handle. It's attached to a cord, lest you should lose it in a field. The CF-30 has its status LEDs on the front side of the keyboard panel, you can see them even when the display lid is closed. All indicators are concentrated near the touchpad, you can see them well even when your hands lie on the keyboard panel. 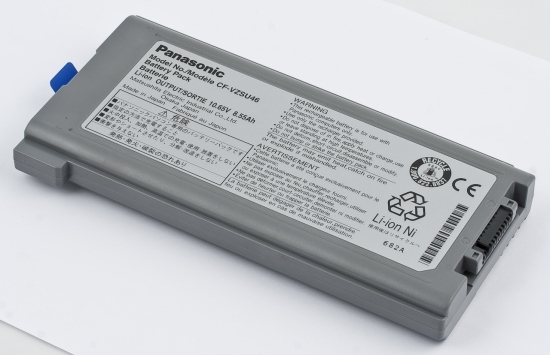 The Panasonic CF-30 does not have additional keys. On one hand, a couple of application buttons would come in handy here. On the other hand, there is no room for them here—engineers would have had to sacrifice ergonomics to install them. We should mention here that all Fn combinations are available. The CF-30 case is designed to provide high operational characteristics in the first place: withstand impacts, absorb falls, not get scratched, protect components inside from jolting, water, and impacts... Nevertheless, the notebook offers a lot of functions and looks attractive. The notebook does not differ much from unprotected models in length and width, but it's twice as thick as a regular notebook. The CF-30 weighs about four kilograms—it's very much for a notebook of this size. I think that such heavy weight was one of the reasons to add the carrying handle. 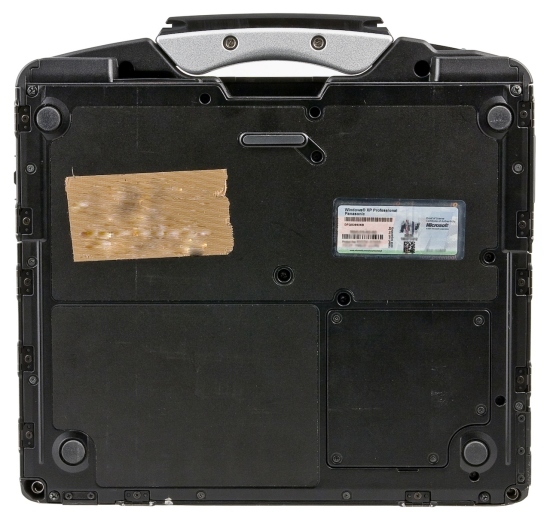 The case is made of metal with plastic inserts. The lid is also made of metal, so you cannot bend it in. All corners are protected with plastic patches. They cushion impacts and falls. Perhaps, they do not wear down that easily. Notebook sides are also covered by plastic inserts. Plastic thickenings on the lid cover antennas and GPS. The case is very strong, it easily withstands falls and impacts. Even though the safe height for free fall is specified to 90 cm, I think that the notebook can safely fall from a much greater height to a hard surface, for example, concrete. However, when I opened the notebook to the limit and then tried to bend the lid further, the hinges started to crackle. Before we proceed to the port layout description, we should give more details about their protection. As it has been already noted, much attention was paid to ergonomics, when this notebook was designed. So those ports you may need in the field are covered with soft rubber caps—it's easy to open and close them. The ports themselves are buried deep in the case to avoid getting wet even when the cap is open. Besides, the ports are sort of "raised" in their hole and installed quite far from the bottom, where water may collect. Those ports that may be used indoors or at least under a roof are covered with large plastic caps with rubber edges and steel latches, which press the caps tight to the case. 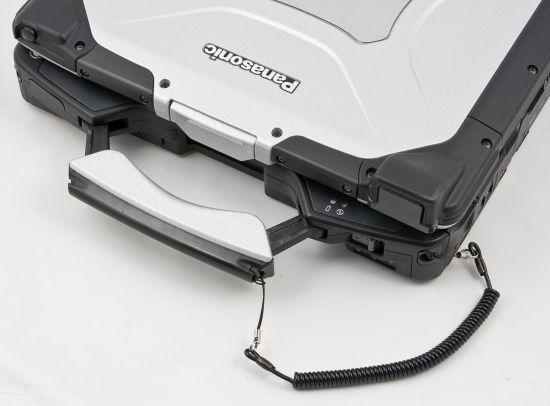 There is a sliding window in the middle of the rear cap with a port replicator under it—you don't have to flip down the entire cap to use this port. And the open sliding cover does not dangle. Now let's have a look at the layout of ports. On the left of the front panel, under the handle, you can see a speaker grid. On the right are the waterproof sliders to power on/off the notebook and its wireless interfaces. 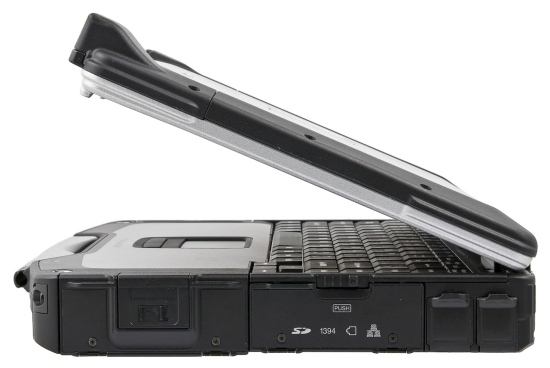 In order to power on or off the notebook, the slider should be moved to the right, after which it returns to its original position. Kensington lock hole and two caps are situated on the rear panel. 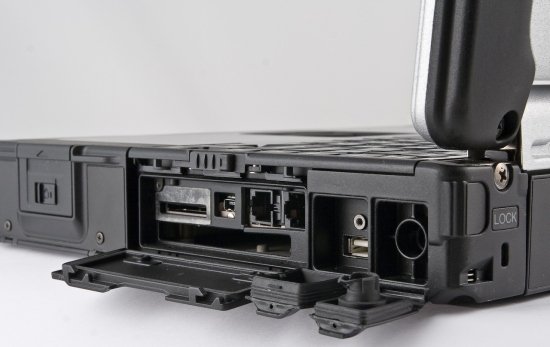 A group of ports is hidden under the middle plastic cover. 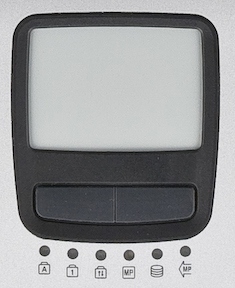 The rubber cover on the right protects RS-232 (COM port). Let's open the caps. As you can see, the rear panel houses two USB ports, a port replicator, VGA port, and audio-out jacks. Note that the rear panel houses only those ports that are used when you work at the desk: a docking station, USB for a mouse and printer, connector for an external monitor, audio-outs for external speakers. And the open cap will be behind the notebook—an excellent solution! There are two large covers on the left flank—one covers the optical drive and the card reader, the other hides a battery. 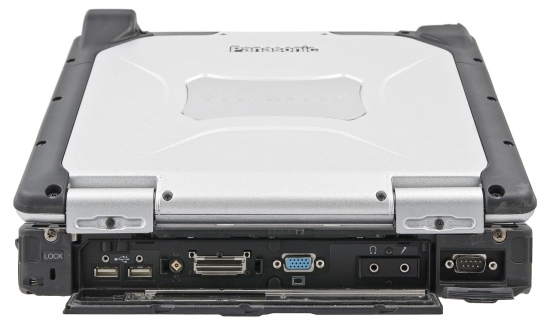 If you open them, you will see two PCMCIA slots for expansion cards and a bay for an optical drive. The second cap covers a huge notebook battery, which provides such a long autonomous life. There are four caps on the right flank: the first one covers a HDD compartment, the second—a card reader and some connectors. Two soft rubber caps cover a USB port and a power connector. Let's open them. 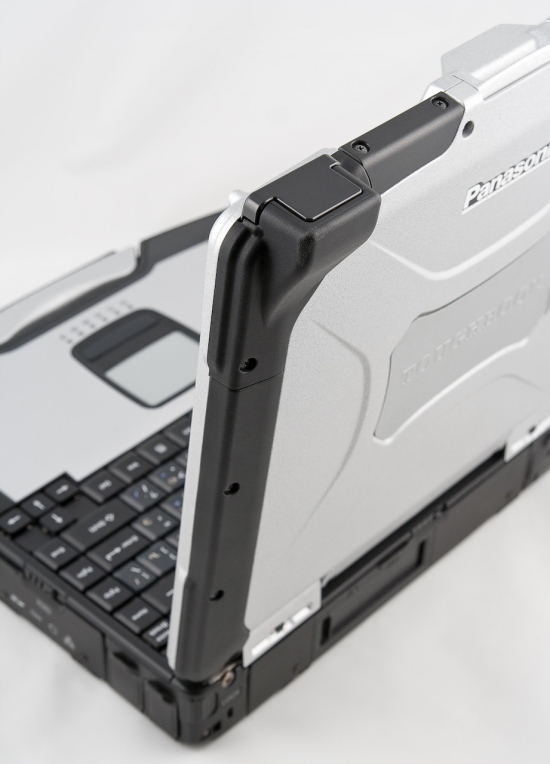 On the whole, the notebook has a very good case—high protection level is combined with good ergonomics. For example, the carrying handle. It's very convenient to carry the notebook. It should be, because, for example, engineers will have to carry it constantly, as they adjust equipment. Besides, the notebook is heavy, and it would have been difficult to carry it without a handle. Another example—users don't have to carry the AC adapter, because the battery life of this notebook covers an entire work day! Neither display nor audio quality are of primary importance here. The notebook is equipped with a usual 13.3" display, 1024x768. These are optimal characteristics for a work notebook. This notebook offers a high level of maximum brightness so that you can work with it in bright sunlight. The display is bright indeed, but I'm not sure that it will be comfortable to work with it under direct sunlight. The notebook has an audio system. But its quality is low. It's sufficient for system sounds, perhaps it will do for telephony, but nothing more. Note that the CF-30 does not have active ventilation, because its case is sealed. The cooling system of this notebook channels the heat away through the case, it remains cool in most cases. Protection is of primary importance in this notebook. As we have already noted, a notebook of this class must survive any accidents in the field without sacrifice of functionality and operability. Protection level of this model is IP54—it's the fifth level of protection from dust and 4th level of protection from water. The notebook is not waterproof, but dampproof—it successfully resists moisture, for example, rain. You can wash it in a shower without any consequences. But you shouldn't drop it in a pool—water may still get inside the case. 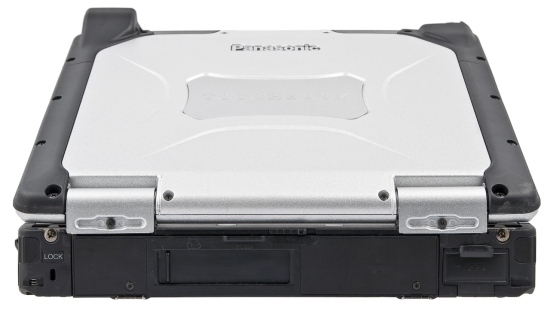 Pay special attention to HDD protection. 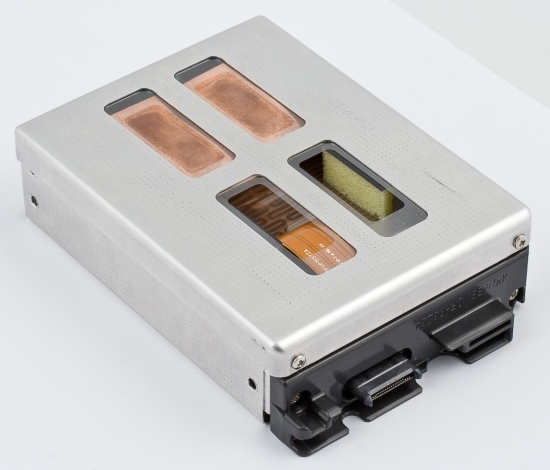 A hard drive inside a special metal container is secured with hard inserts (sort of a cross between polyfoam and porolon), which absorb impacts and vibrations to protect the hard drive. Besides, the container is equipped with a heating system—if you work with the notebook in cold weather, the hard drive will be warmed to stay within official operating temperatures. Many modern notebooks now use acceleration sensors, which park HDD heads, if they detect vibration or impacts. This idea might have worked for this notebook as well. But according to the manufacturer, this system cannot be used in industrial notebooks. 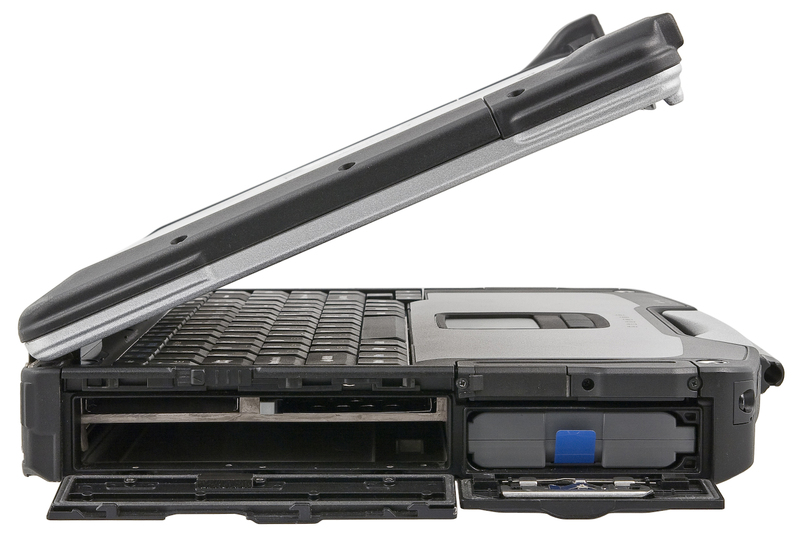 Rugged notebooks are often used in vibration, so this system will inevitably malfunction. Using flash drives seems even a more promising idea. I think that the next model will have such an option. 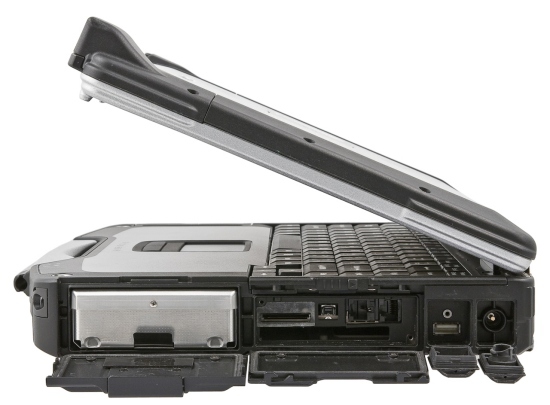 The notebook comes with a hardware RS-232 port (COM port), which is actively used by industrial equipment. The CF-30 has advanced wireless features. The notebook is equipped with Wi-Fi and Bluetooth interfaces. Besides, there is an option to install an HSDPA modem and GPS, which may come in handy in great many cases in a field notebook. And finally, the CF-30 has a high-capacity battery—the notebook can work for 8-9 hours in battery mode, that is an entire workday. So, if you come out to field work, you may leave the AC adapter on your desk—the notebook will work on a battery for the whole workday. The notebook has a number of accessories to make your experience even more convenient and to add more functions. For example, the second battery, which is inserted instead of the optical drive and prolongs battery life. Besides, you can buy a special device to charge batteries, removed from the notebook. You can also buy a docking station to work with the notebook in your car. We've tested how the notebook deals with falling down and spilling water on it. You can watch this test in our video review. Notebooks often fall from desks even in an office with well-organized desks. The more clutter on your desk, the higher chance, for example, for someone to catch on a power cord or wave a hand and send your open notebook spinning down to the floor. An office notebook may fail to survive this accident. 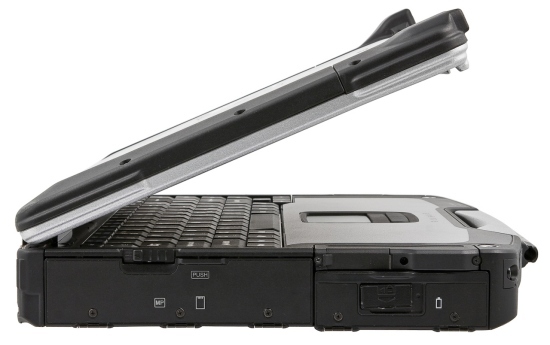 Toughbooks must survive such accidents and carry on with their tasks—it's a normal situation for such notebooks. Especially if you have to work outside your office, where the notebook will rest on various objects. The same concerns spilling liquids. Even if your notebook always stands in the same place, and you know safety procedures and stick to them, it does not guarantee that you won't spill water on it or you won't drop it. Accidental spillages are quite possible even in an office. Such risks are much higher for a traveling notebook, because it constantly works out of its workplace. It's very important that the notebook should resist rain. Moreover, if there is no rain in your territory, you may experience problems with sand or dust, so protection from both types of exposure will be always useful. Besides, if your notebook fell into dirt, the easiest solution is to rinse it with water. So, being dampproof is useful here as well. By the way, pay attention that both the display and keyboard in the CF-30 are protected from water. Some notebooks have only dampproof keyboards. If spilt water gets somewhere else, the notebook will certainly be disabled. The Toughbook will successfully resist any liquid. But if you spill sweet tea on your keyboard, it will become sticky. We've spilt coffee on our keyboard, and it still smells (not of coffee). So you should rinse your notebook in water, if you spilled something on it. Why do you need this notebook? It costs about 4 800 USD. Nevertheless, it's a very expedient product in some cases. Try not to think about the price of this product and analyze expenses in the field, where it will be used. For example, if a group of engineers is sent in a helicopter on a business trip for two days, how much will it cost to send for a new notebook, if the old one fails? For example, how much do you value your data, if your notebook falls out from a car and breaks to pieces? How will you find your road back from a forest, if your notebook with GPS tracks was exposed to water? And so forth. The price of a rugged notebook includes many other things. For example, how much money it will save, because it does not fail in the heaviest conditions. Even the touchscreen is a huge advantage—because it's much faster to enter data using the touchscreen, holding the notebook on your laps. By the way, we should mention another peculiarity of the CF-30. Protection requirements are met by all notebooks of this family. However, much work has been done on usability of this notebook. For example, the carrying handle—it's an original and very convenient solution. The stylus is attached to the notebook with a cord, lest you should lose it. The HDD protection system, high-capacity battery—it's all well thought-out. All these features form a convenient tool, which will be appreciated by professionals. It's a highly specialized notebook. And a very expensive one. Nevertheless, it will find its users even in those companies that prefer to save on everything—those who can count all expenses, not just its retail price. The Panasonic CF-30 is a functional and convenient product that offers top protection from hostile environments. We express our thanks to Panasonic for the provided notebook.